i-Flip is a two player game that is somewhat of a cross between a foosball and an air hockey machine. Gameplay is simple to understand and is suitable for all ages. Each player uses a large joystick which controls a bar near the players goal mouth. Players must defend and attack, and must sink as many balls as possible through the adversary's goal to win. Randomly throughout play, 4 balls are launched through an automatic balls launcher, leading to even more frenetic play. The machine also has an automatic electronic counting goals system, through an optical sensor. i-Flip is a two player game that is somewhat of a cross between a foosball and an air hockey machine. Gameplay is simple to understand and is suitable for all ages. Each player uses a large joystick which controls a bar near the players goal mouth. Players must defend and attack, and must sink as many balls as possible through the adversary's goal to win. Randomly throughout play, 4 balls are launched through an automatic balls launcher, leading to even more frenetic play. The machine also has an automatic electronic counting goals system, through an optical sensor. 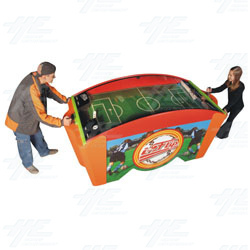 i-Flip is a soccer style arcade table where players must try hit balls into the opposition's goal using one large flipper.